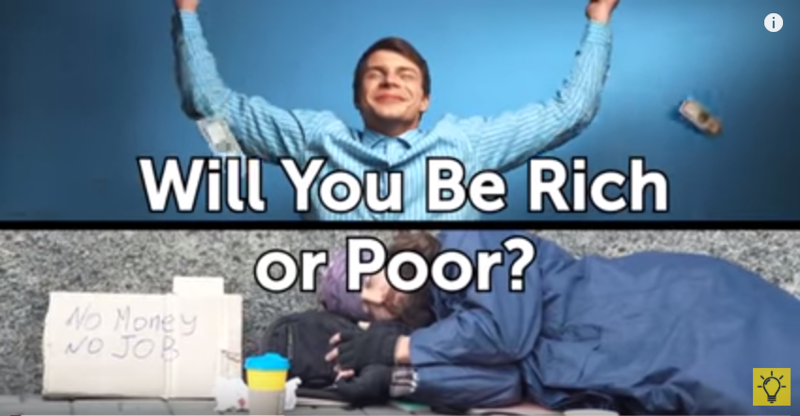 Will You Be Rich or Poor ? In your mind, do you approach life as a rich person or one with very little money in their bank account? How to Know if You’ll Be Rich. They say money can’t buy you happiness, but most of us still wouldn’t mind having a little more of those unhappy bills. So let’s find out if you’re gonna have more than enough or barely enough to get by! You’ve got 10 questions to answer. Don’t overthink it; just go with the first option you like! This video is intended for entertainment and information purposes only. The video is not intended to serve as a substitute for professional, medical or psychiatric advice of any kind. You’re offered a deal: you either get $10,000 right now or have to wait a year but get $100,000. What would you choose? -Will you go for the second pair of shoes you didn’t really plan on buying just to get the third one for free? -Speaking of shopping, do you make shopping lists and keep a budget? -Will you get the latest greatest smartphone model everybody’s buzzing about? -What’s the perfect birthday gift for you? -Would you go to a concert that is in 2 days for free if it’s 1,000 miles away? -Describe your eating habits. -Would you rather have a well-paid secure job that’s boring or do something financially risky that you enjoy? -Imagine you’re offered a promotion, but they’d have to fire your best friend. What would you do? -What’s the meaning of life in your opinion? -If you got 100 to 160 points, you’ll be living in Saving Mode. -In case your final score is between 170 and 230 points, you’ll be Quite Comfortable. -If your total came to 230 to 300 points, congratulations! You’re a Future Rockefeller! Please leave a comment “Personality” in the comment box below to let us know if you appreciate what we shared so far in this post. We would like to hear more from you.